Debbie's Creative Spot: Easter Lamb Baby Card and NEW Sale - A - Bration Items! 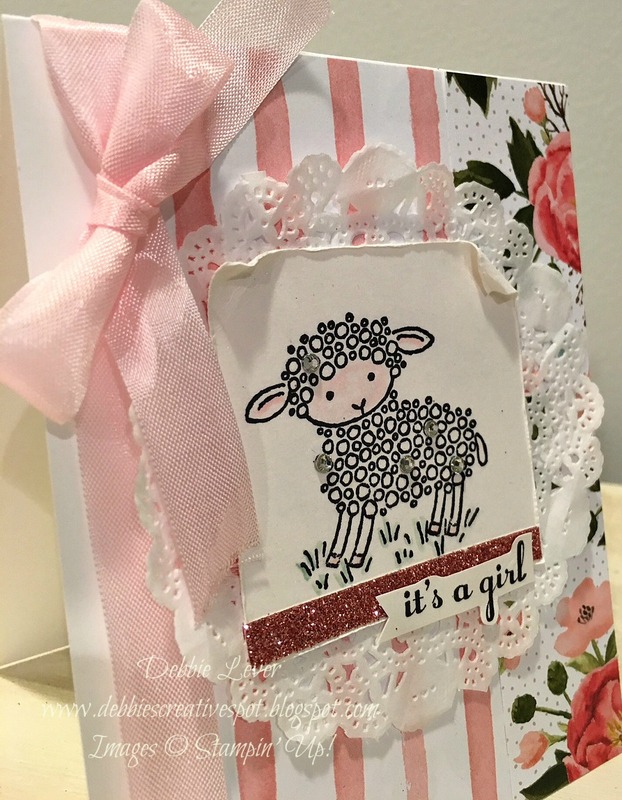 Easter Lamb Baby Card and NEW Sale - A - Bration Items! I have another card for you today using the Easter Lamb stamp from the Occasions Catalog 2016. 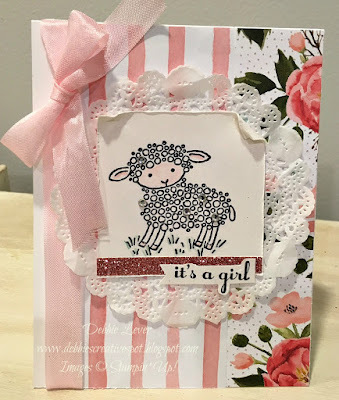 I thought this adorable little lamb would make the perfect card for a new baby! My card base is thick Whisper White cardstock cut 4-1/4 x 11" and scored at 5-1/2". I find it is best to score the Thick Whisper White cardstock before folding in half to avoid puckers. I then layered pieces of the simply gorgeous Birthday Bouquet Designer Series Paper. I cut them about 1-1/2" x 5-1/2". I wrapped a piece of Pink Pirouette Seam Binding Ribbon around the card and tied a bow. The seam binding ribbon is so easy to handle. I stamped just the lamb portion of the stamp ( omitting the Happy Easter portion of the stamp) using Archival Basic Black Ink onto a piece of Shimmer White Cardstock. Using a Blender Pen and ink, I colored the ears and face in Pink Pirouette and the body using Smoky Slate. For the grass I used Mint Macaron. 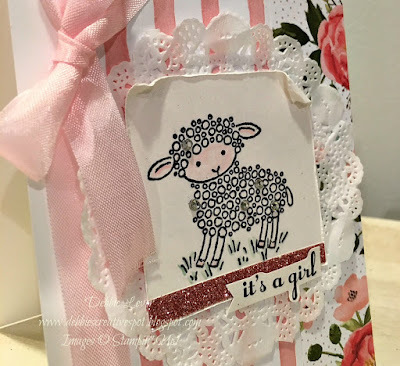 I thought this little lamb needed a bit of sparkle being that it is for a baby girl, so I added Rhinestones. 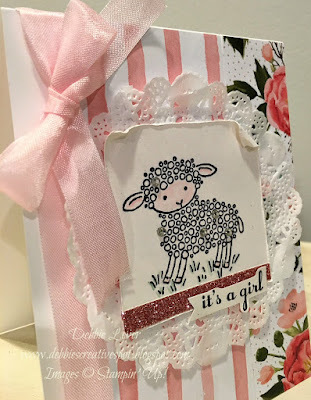 A little bling and a little glitz for this girlie card! Do you love the strip of Blushing Bride Glimmer Paper? That is all it needed! The sentiment is from A Dozen Thoughts stamp set. 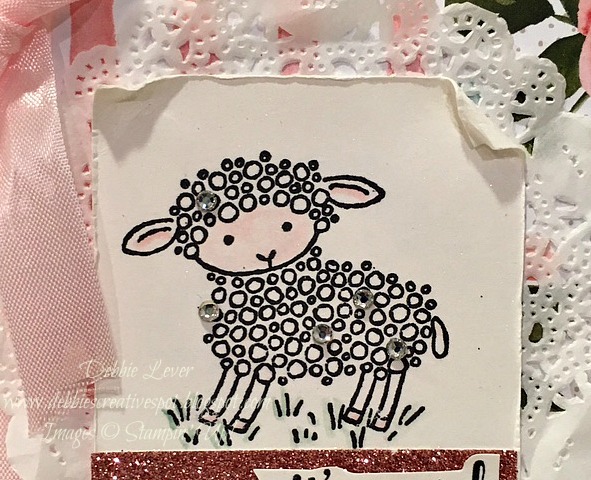 Next I adhered a doilies onto my card front, then used dimensionals on the back of the finished lamb piece to put in place. Isn't it sweet? I think I'll make one for a new boy baby next. Stay tuned!